Summery Berry Compote – These were yummy whole wheat shortbread style cookie with a berry compote filled with raspberries, strawberries and black currents. Grilled Cheese – Loved these mustard breadsticks and cheddar cheese bruschetta crackers with smoked almonds. Soy Roasted Seeds – I’m not typically a fan of seeds, but this was a good mix of roasted sunflower and pumpkin seeds. Chia Choconut Cookie & Tea – Interesting mix of black tea and a coconut chia cookie for dipping! Sweet Rhubarb Jam – A super yummy mix of deliciously dried rhubarb slices, cranberries and apple pieces. Kettlecorn Kern Pops – A mix of sweet and salty half popped corn kernels! Peach Cobbler – Ohhh yum! We have amaretti cookie drops which are so fun! Peach fruit drops made with peach puree! Almond slivers and yogurt coated sunflower seeds. Sweet Mustard Ranch – A yummy combo of salted pretzels, YUM! Mustard breadsticks, again but also yummy, and sour cream and onion flavored cashews which is a funny but yummy combo! 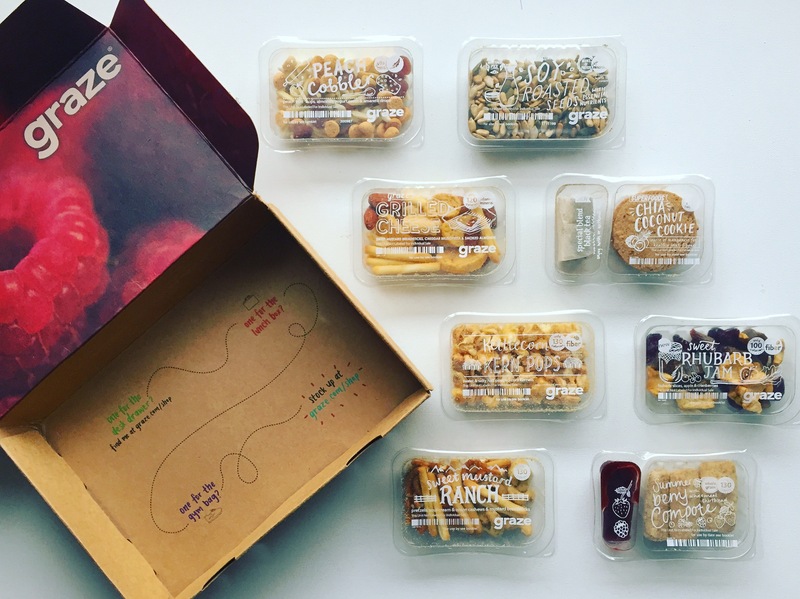 Love Graze! I did this box for a while, but only ended up loving about half the snacks. For someone with a more adventurous pallet, this box is super yummy.